We are down to the final week of Edinburgh Fringe and from the publicity, press, reviews and statistics it has been bigger than ever. At Keytree we helped Assembly Festival provide a website to promote and sell tickets along with an app for delivering daily deals so you can make the most of your Edinburgh Festival. 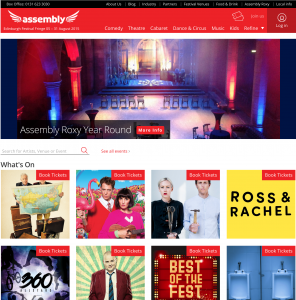 There are tickets available for Comedy, Musicals, Cabaret and much more including covering performers such as Al Murray, Josh Widdicombe, Dan Clark, Andrew Lawrence and many more.